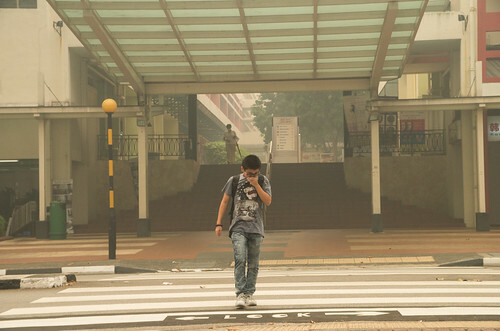 A boy covering his nose while crossing the streets near Bukit Merah Central – the PSI has reached a high of 400 in this small city state, reaching hazardous levels. 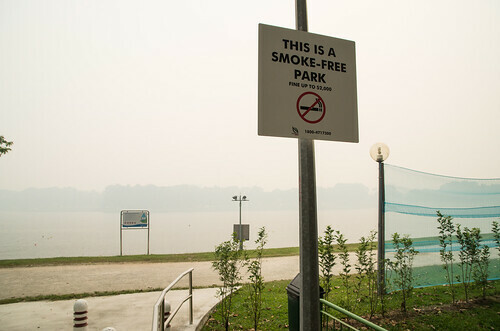 Singapore is now facing one of its worst environmental crisis at the moment, with the tiny but resilient nation enveloped in a thick layer of smog and haze caused by rampant and indiscriminate burning of forests and clearing of land in neighboring Indonesia, fueled by a lack of political will on the part of the Indonesia government to rectify the situation. 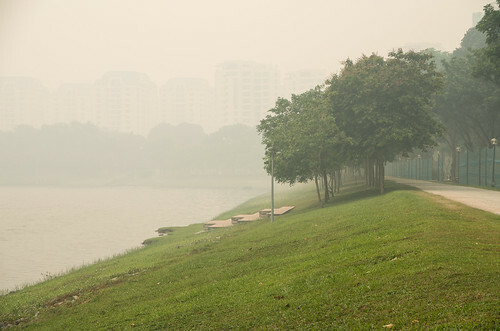 While Singapore officials are right now in Jarkata trying to talk some sense into their counterparts, Singaporeans are caught up in a whirlpool of debris, microscopic particulates flying in the air that have the potential to cause respiratory diseases, re-awaken old ailments and potentially causing cancer with the carcinogenic nature of these minute particles. 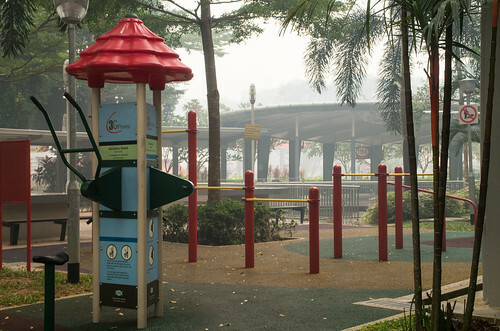 A playground at Bukit Merah Central deserted – the haze has kept everybody indoors. This is World War H (to borrow the title of the book / movie World War Z) – with the big letter H for Haze. 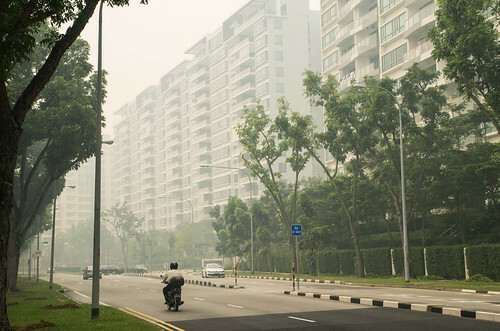 This morning, the 3 hour average PSI level of Singapore hit an all time high of 400 at 11am (which means the hourly PSI reading is higher than 400, given 400 is a 3 hour average). 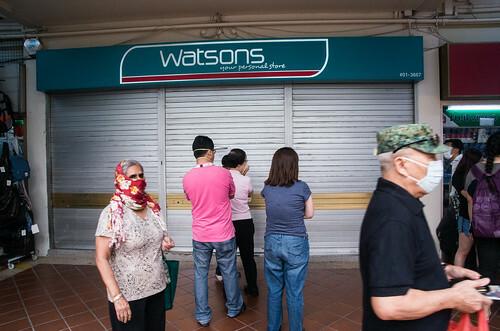 This is more than hazardous, with the government issuing advisories for the elderly, young and sick to stay home, as well as suspending outdoor activities across schools and civil services, even to a temporary suspension of out field training for the military. 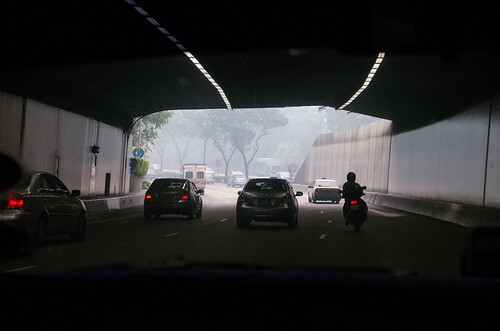 Coming out from a tunnel, the midst can be seen on the streets, greatly reducing visibility. 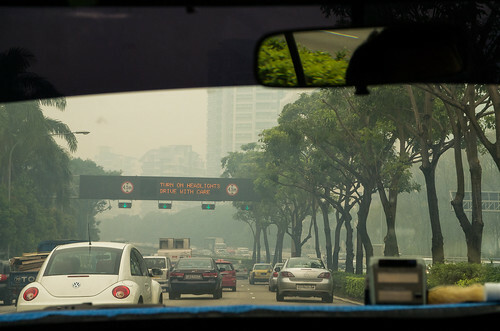 Cars are advised to turn on their headlights – in the daytime, to see through the thick haze. 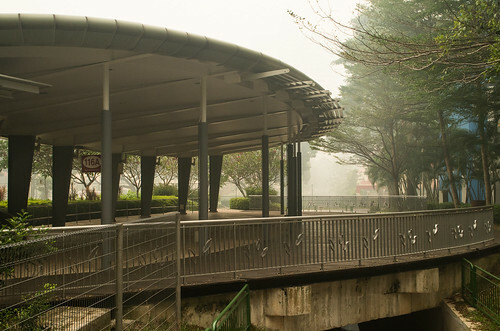 A lone figure walking under a rain shelter – this will not be enough to hide from the haze. 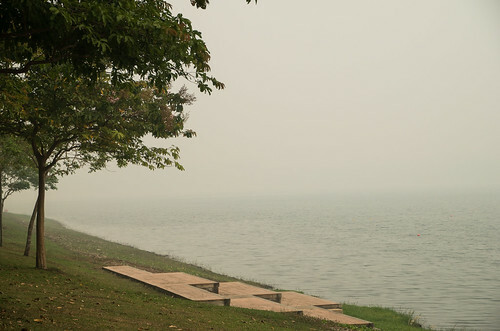 Another view of hazy Bedok Reservoir. 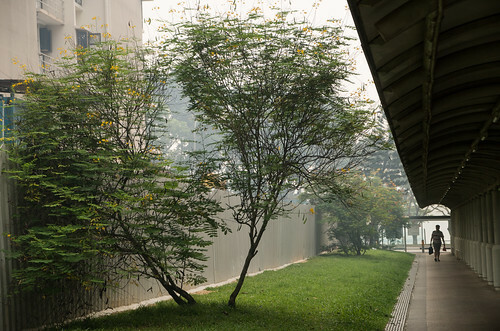 N95 masks are in short supply, with the government promising to release more to the local pharmacies. 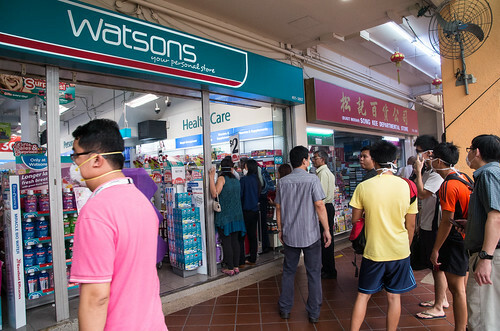 A wave of panic buying of masks was also triggered, with N95 masks being particularly in demand, as Singaporeans, and foreigners living here sought to protect themselves from this unnecessary man-made pollution. However, life goes on as normal for now, with no “stay at home” orders. 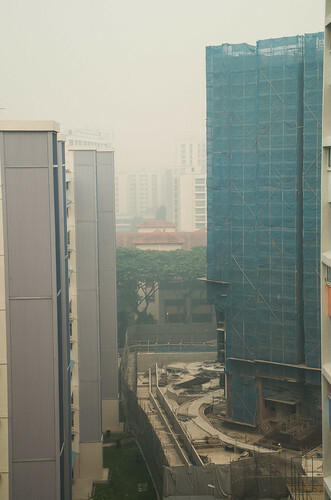 Curiously I can still hear construction work going on, with workers exposed to a high level of hazardous haze. These poor workers should really be given a break! 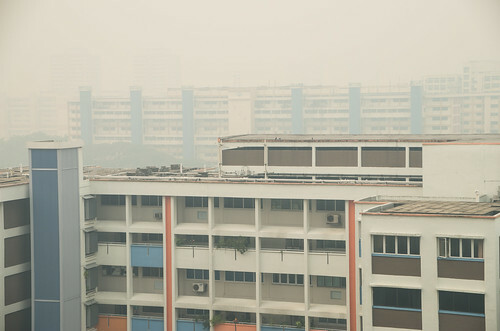 Curiously I can still hear construction work going on, with workers exposed to a high level of hazardous haze. 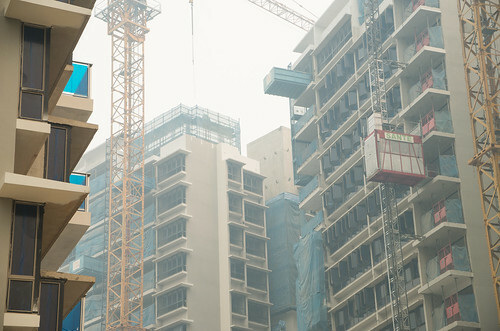 New condominiums being built – I can still hear the sound of construction going on, even with a PSI of 400. 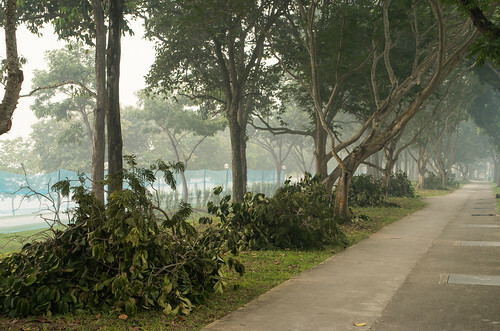 Signs of tree clearing along Bedok Reservoir Road – work still goes on for these workers, it seems. 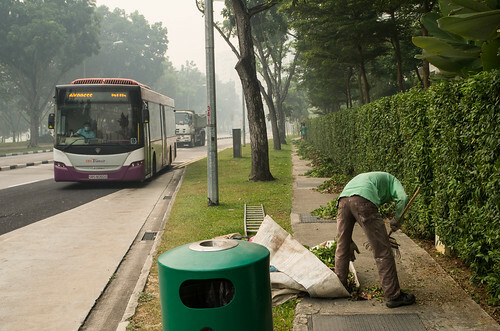 Haze or no haze, we salute these workers who carried out their duties selflessly. 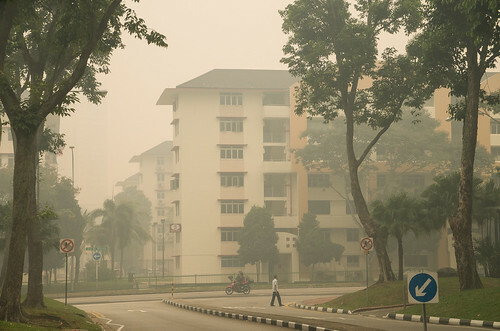 Without a proper N95 mask that can trap particulates in the air of less than 3 microns (because I can’t buy one – it’s all sold out in Singapore in a wave of panic buying), I ventured out this morning at a PSI of 367 to photograph and document the haze situation. 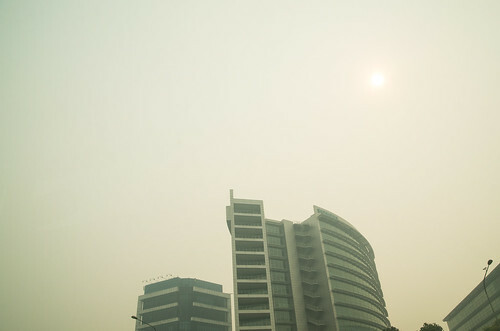 This is the day I really felt the effect of the haze – my eyes became irritated and the stench of burning persisted even on my clothes even after I came back indoors. Unbeknownst to me, the PSI hit an all time record high of 400 while I was outside. So, this is what PSI 400 looks like. 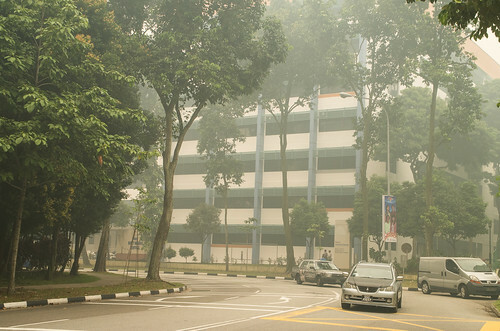 A man crossing the road in the smog near Bukit Merah Central – PSI has climbed to 400, an all time high. Even the sun is smoked out, trying to shine through the haze with a PSI of 400. When I went out with my camera, it was like landing in Basra, Iraq, after a wave of coalition bombing, with dust and smog covering everything for miles, and nary a soul on the streets, with everyone hiding indoors. This place feels like a war or disaster zone at times. 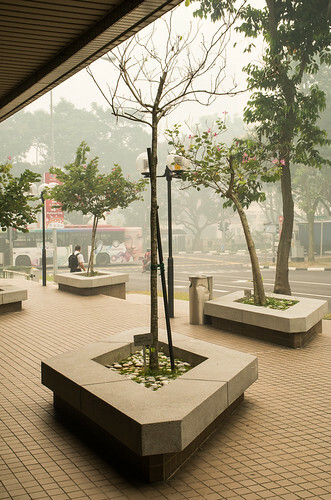 Visibility has dropped as haze envelops the whole of Singapore. No part of the country is spared. 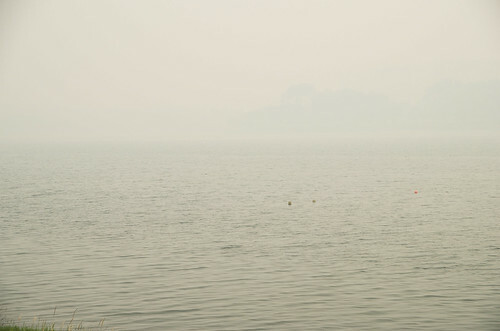 Riding into the smog – a rider rides into the haze. I hope he’s wearing a N95 mask. The lobby of Spring Singapore looks romantic in the midst, like Paris. Until you smell the smog, that is. More pictures available here at my Flickr set on World War H – PSI 400.